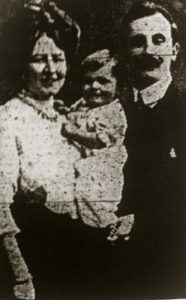 Edward Booth Jones was born in Conway on the 28th March 1876, the second son of John and Sarah Jones, of Rhos–on-sea, Denbighshire, North Wales. 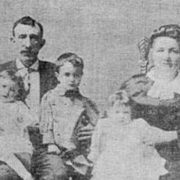 John Jones was well known as an agriculturalist, and animal breeder. Sarah Jones family were the owners of Dinarth Hall, Colwyn Bay, North Wales. Millichamp Letton Percival was born on the 29th January 1877, at the Old Black Boy Inn, Newton in the County of Montgomery, her grandmother Georgina was present at the birth. 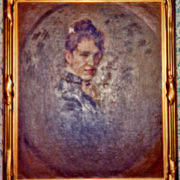 Her parents were Henry Letton and his wife Charlotte Amelia Percival (nee Jones). 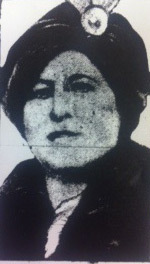 Her father was described as a Commercial Traveller. On the 25th February 1877 Millichamp was baptised in the local church at Llanllwchaern and her birth was registered on the 28th March. 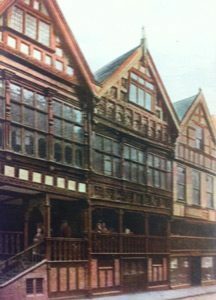 Rather than go into the family business, Jones decided to start his career in the auctioneer trade, employed at Hall, Wateridge and Owen based in Shrewsbury. It was here that he met his future wife Millichamp Letton Percival and the couple were married on 22nd March 1902, both aged 25, in the Parish Church in Newton. 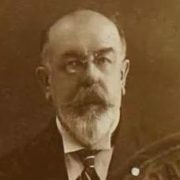 At the time of his marriage he was living at Cedar Grove in Manchester, and described himself as a dealer in antiquities and works of art. The couple settled down and Edward moved his business to Manchester. At some point Jones decided to hyphenate his surname to Booth-Jones, probably to give himself a higher social status. 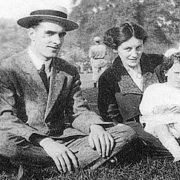 Their first child, a girl was born on the 19th December 1906 was named Ailsa Georgina in Bowden at the old Cottage in the County of Chester. It was here that Jones purchased the Old Bishop’s Palace and set up his antiques and fine art business. A son, John Percival was born on 4th October 1909. 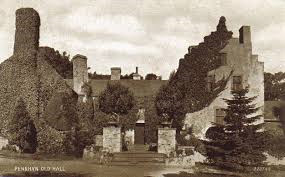 It appears from the properties that Jones bought that he was enthusiastic about Tudor and Elizabethan buildings as he went onto to purchase Penryn Old Hall. Booth-Jones decided to sell up and move to London, opening up a shop on Bond Street. (Incidentally along the same street as another Lusitania victim Max Edgar Gorer.) The family took up residence at No 3 Old Palace Terrace, The Green, Richmond, in Surrey. The threat of war was having an adverse affect on the art world in Europe, so he moved to the United States in October 1914 taking his young family with him, whilst there they stayed at the home of Dr and Mrs McCarthy of 136 Price Street, Germantown, Philadelphia. 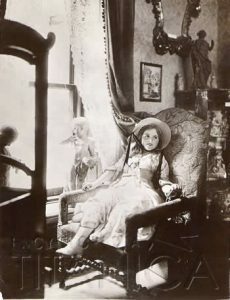 Booth-Jones opened up an antiques business on 5727 Germantown Avenue and held private sales in galleries in Philadelphia and New York. 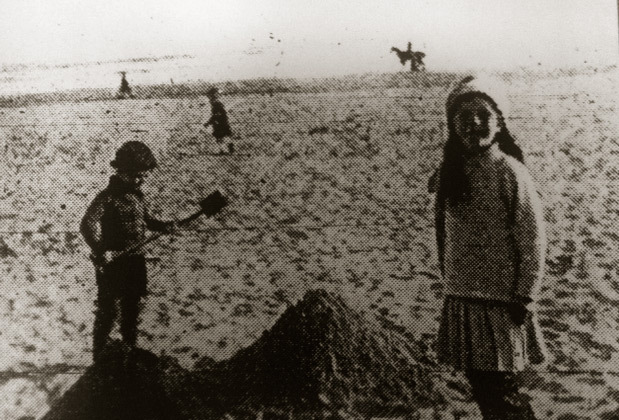 During their short stay, the family were able to travel down to Atlantic City, New Jersey and build sand castles on the beach. 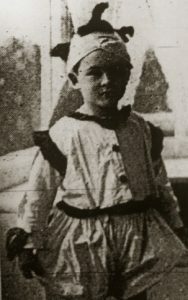 Although the family could afford to travel first class, they decided to book second, an acquaintance of Edward Booth-Jones, Mr Albert Smith of New York also worked as an art dealer for Ackermann & Sons who was travelling back to Cardiff with his wife and infant daughter Dorothy, so they all travelled together. The day before sailing the family stayed at the Waldorf Astoria, Ailsa was remembered as having her photograph taken at the hotel. 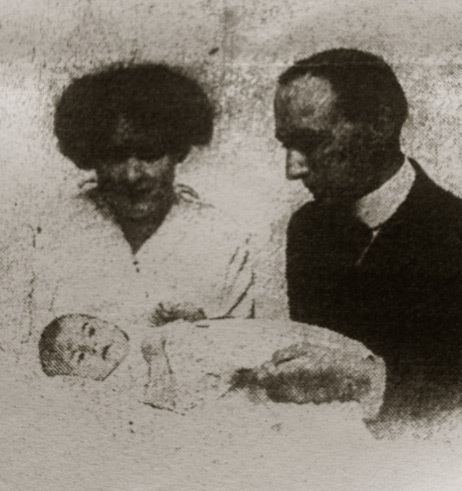 On the morning of the 1st May, Ailsa gave a copy of the picture of to Harry Zehner one of Waldorf’s assistant managers who had admired the family. (The picture was used around the world and it became an iconic image similar to that of the Cromptons.) They departed the hotel and headed down to pier 54 to join the Lusitania. 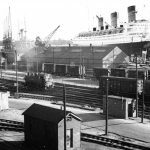 They boarded the Lusitania expecting to depart at 10am unfortunately there was a two hour delay whilst the ship took on extra passengers and cargo, and settled down to ship board life, not much is know about their activities but it is known that Ailsa and her brother entered the ship board deck races. Ailsa was remembered as proudly showing Professor Holbourn and Avis Dolphin the rosettes she won. During the sinking of the Lusitania on the 7th May, one second class passenger, Mrs Albert Secchi of New York, remembered seeing Mr. and Mrs. Booth–Jones, in the door way of their cabin putting on life belts, there was no sign of the children – presumably on deck at the time of the disaster. Initial reports hinted that the children had been saved. 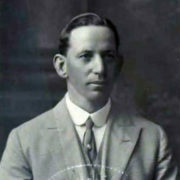 This prompted Edward Booth-Jones brother Griffiths Jones to rush to Queenstown to look for them. The notice is signed Griffiths Jones, Imperial Hotel, Queenstown. Unfortunately not one of the family survived, and Mr Smith, his wife and infant daughter vanished without trace. #213. Miss. AILSA BOOTH-JONES (s/c) Passenger. Buried Queenstown, May 16th; Private Grave, Row 15, No.17. Property forwarded to Mr T. J. JONES. 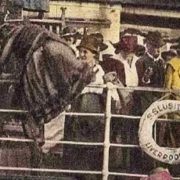 It was noted that when Ailsa’s body was recovered, she was wearing a green velvet dress, lace-up boots and a blue jersey, and an imitation gold brooch of the Lusitania still pinned to it. If father and son were recovered they were not formally identified. In the Scarborough Mercury in June 1915, a surviving Steward gave the following account. Shortly after I came to the surface, I saw a dear little fellow in the water close to me. I got hold of him and lifted him onto a plank which I was holding onto. He was a bright little fellow but he kept crying. I tried to pacify him and to this I think I owe my own life as talking to him and trying to comfort him made me forget my own trouble. A gentleman drifted by us, and with a smile said the child was his boy. The steward said the boy was alright, and asked the man if he could take him. “I’m afraid not” was the reply, “but do your best to get him ashore, and good luck to you,” The steward continued to talk to the little boy, “and the father for about 10 minutes longer, hung on near by close to me, then all at once he seemed to go to sleep, and up went his arms and he died. He continued to float close to me all afternoon. I kept the boy for two hours after that but I could not keep life in him. He gradually faded away in my arms and the sea was washing over us. When there was no hope of life he kissed the child and the latter sank. The steward recognised father and son from pictures that were being shown. S.S LUSITANIA MAY 7TH 1915. From the records Probate was done in London 9 February 1916 to Charlotte Amelia Percival widow Frank Marris Provis auctioneer & Thomas John Jones farmer, total value of the estate was £3630.8s.11d. One wonders what Edward Booth Jones would make of the property’s he owned and lived in during his life time. Dinarth Hall is now a caravan park, Penryn Old Hall is now a hotel and public House, The old Bishops Palace is now a massive shopping arcade, only the external Tudor building remains. Although sad that a young family died in their prime, they are some of the few Lusitania victims who have memorials dedicated to them and are remembered to this day.